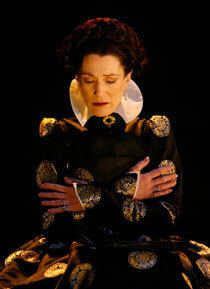 If you are the type of theatre-lover who yearns for a chance to worship at the altar of diva-dom, run don't walk to the Broadhurst Theatre to see Janet McTeer as Mary, Queen of Scots and Harriet Walter as Queen Elizabeth I in a fresh, riveting and timely retelling of the story of the familial rivalry between two cousins, Mary Stuart. You know you are at a true hit on Broadway by the level of glitterati in the audience. In attendance were none other than opera diva Jessye Norman, actress Kate Burton, Oscar winner Kate Winslet and adult film entrepreneur Michael Lucas. Let me set the stage. The time is 1587 and the setting is Fotheringhay Castle, where Mary has been kept captive for some nineteen years after fleeing Scotland, and the royal court of Elizabeth I. Mary, who has been stripped of nearly all her personal effects in a startling beginning to the evening, is attended by the devout Hanna Kennedy, her nurse since childhood. Elizabeth is attended to by a large group of courtier all dressed in nearly identical European-cut suits in monochromatic shades of gray. Mary has been held captive under the premise that she has incited the rebel cause and allegedly plotted to have Elizabeth assassinated. Making up the court of Queen Elizabeth are Brian Murray as the voice of reason and the great conciliator, the Earl of Shrewsbury. Hunky Chandler Williams is the love-struck Mortimor who is devoted to freeing and loving Mary and ultimately falls on his own sword. John Benjamin Hickey is the conniving two-faced Earl of Leicester and Robert Stanton is the gullible fall-guy for Elizabeth, Sir William Davison. Nicholas Woodeson is the yappy and officious Lord Burleigh. These men, dressed in modern clothes while the women were left in period frocks, made me think of congress. These men were outstanding in their roles. The understated set by Anthony Ward is merely a brick wall. The lighting designer, Hugh Vanstone uses the brick wall as a canvas and brings the set to life painting with angular lighting which cast tall shadows up the brick wall. 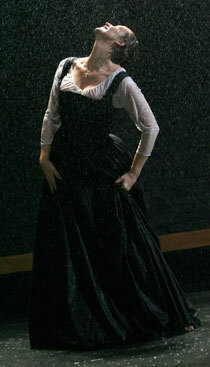 In the most talked about scene in the play, a scene that starts with the exuberant Mary being let free in the yard, we experience an on-stage rainstorm in which Mary dances about with pure abandon with her nurse. Unfortunately, this momentary freedom has been pre-arranged by Elizabeth so that she can have her chance meeting with Mary. Apparently this scene is more fiction than fact as the two never met. This scene is the pièce de résistance of the evening as the two queens get to dig their teeth into this rich new adaptation of this 200+ year old play by Peter Oswald. 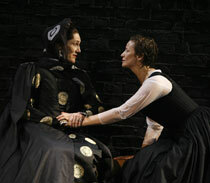 Divas McTeer and Walter bring emotional depth to their characters that mesmerizes the audience; Walter as the stoic, pent-up Elizabeth and McTeer as the free-at-heart Mary whose emotions during the course of the play range from her giddy romp in the rain to her vacillation between groveling to and venomously spitting at Elizabeth. Mark my words, you will see both of these two ladies in the same category when the Tony nominations are announced on May 5th. Finally, a word about the brilliant direction of this play by Phyllida Lloyd, whose most recent Broadway claim-to-fame was none other than Mama Mia! Don't let that fool you, Ms. Lloyd is an accomplished English director of theatre, opera and television. At moments her direction was more choreography than direction as large numbers of people moved in unison. Actors don't arrive at performances like those given by McTeer and Walter without an exceptional hand like Lloyd's at the helm. There is no doubt that Ms. Lloyd is the English equivalent of Broadway's own Jack O'Brien who fluidly moves back and forth between plays and musicals with equal aplomb.